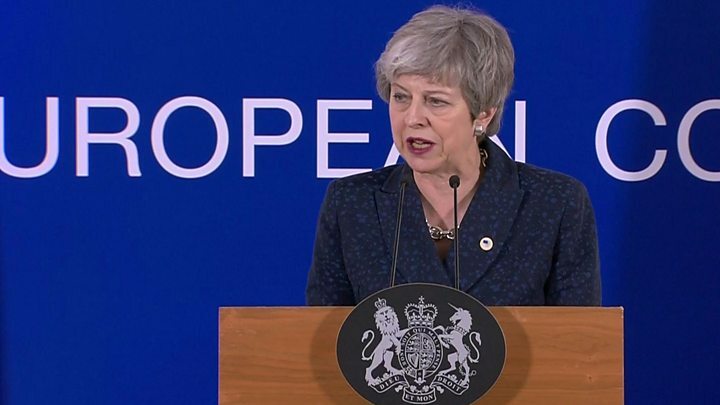 Media caption"I hope we can all agree we are now at the moment of decision"
The EU has agreed to postpone Brexit from next Friday and give UK Prime Minister Theresa May more time to get her deal approved in Parliament. But - and with Brexit there is always a but - it is not as simple as it may sound. Here is what just happened, why it matters, and what might happen next. But the EU says a further extension beyond 12 April is only possible if the UK agrees to hold European elections on 23 May. Mrs May has said the UK will not take part in the vote. The EU's offer means a no-deal Brexit is considerably less likely on 29 March. But it is not off the table yet and the way forward is far from clear. It had been thought MPs would vote for a third time on the Brexit deal next week. Now Mrs May has suggested to MPs this might not happen "if there is not sufficient support". A third attempt at getting her deal passed had already been thrown into doubt by House of Commons Speaker John Bercow. Earlier this week, he cited parliamentary precedent to rule that a third vote could only take place if the proposal on the table was substantially different from the previous one. Another task facing MPs is to change the legally-binding 29 March date to leave the EU. The UK leaves under Theresa May's EU Withdrawal Agreement on 22 May, to enable Parliament to pass all the legislation needed. But getting it approved will be a tough task for Mrs May, especially after she angered MPs on Wednesday by going on television to essentially blame them for the impasse. She did offer a more conciliatory tone on Thursday but it remains to be seen if she will be able to convince MPs to back her agreement. What does this mean for Mrs May? The BBC's political editor Laura Kuenssberg says the choices for Mrs May are running out, making her leadership difficult to maintain. Many MPs within her own party are alarmed by the events of the past few days. And, she says, it is likely that MPs from all parties will push for a series of votes on different versions of Brexit or another referendum, in an attempt to take control of the process. Mrs May arrives back in the UK today, writes Laura Kuenssberg, having won a little bit of extra time, but less and less space to breathe. How does the EU see it? EU leaders were reportedly unconvinced by Theresa May's assurance that she could convince the UK Parliament to back her withdrawal deal. Mrs May made her case for a delay in a 90-minute presentation to her European counterparts and then left the room and the discussions continued for eight hours. French President Emmanuel Macron said he thought she had a chance of 10% of having her deal approved but after listening to her he had cut his estimate to 5%, Reuters news agency said. European Council President Donald Tusk replied that Mr Macron was being "very optimistic", it reported. But the end could be in sight? Not yet. It is worth remembering that the debate now is focused on the terms of the UK's exit from the European Union. The conditions of the future relationship between the country and the bloc still have to be negotiated.